“Think of our new village here as the home of Jesus Christ, not the scene of a disaster,” the Reverend Joseph Lejeune told the smashed souls in a tent city in Port-au-Prince. “Life is not disaster. Life is joy! You don’t have food? Nourish yourself with the Lord. You don’t have water? Drink in the spirit.” One of the aftershocks in Haiti has been the revelation that belief may be immune to experience. The survivors are praying to the author of the destruction. Their metaphysics is their shelter, and I would not deny them their metaphysics as I would not deny them a bed. Yet this is very unVoltairean. 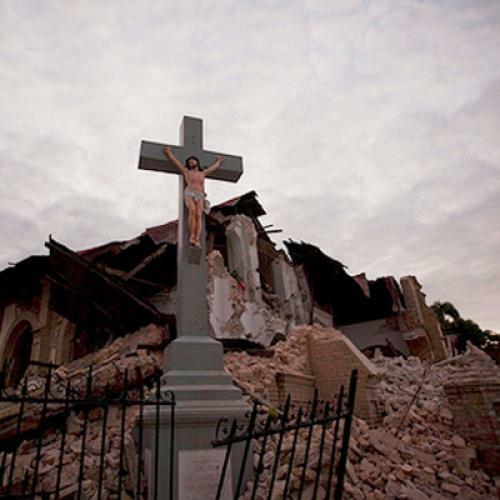 Was not God buried in this rubble, as He was buried in all the rubble that preceded it? What happened in Haiti ought to bring philosophy back, except that nothing can bring philosophy back. In an intellectual universe that consists mainly in position-taking, everyone comes away from the enormity with a tingle of validation. The complacence of the theists is matched by the complacence of the atheists. The cocktail-party Karamazovs shake their fists at the live feeds and gleefully pounce on the latest confirmation of their belief in the cruelty of the deity that does not exist. In their scorn for the religious explanation of evil they omit to explain it themselves, except perhaps to extol “lucidity,” which is of course not the beginning of the answer but the beginning of the question. There is nothing analytical or heroic about knowing the facts. And to regard all this suffering as meaningless seems indecent. One can always adopt the standpoint of the cosmos, and in this way detach oneself from the pain and the perplexity, but then one cannot call oneself a humanist. Watching the charnel scenes in Haiti, I wonder, without much mental satisfaction, whether in such circumstances it may not be the highest achievement of the spirit to be stuck. For the relation of belief to experience is a complicated matter, and not only in a catastrophe. It is as foolish to assert that God does not exist because I am unhappy as it is to assert that God does exist because I am happy. In the ruins of Haiti, I do not see how one can be nourished by the presence of the Lord and I do not see how one can be nourished by the absence of the Lord. The earthquake leaves the metaphysical problem where it found it. I know, I know. What else were they going to say? But something is amiss with this notion of policy as theodicy. For it may well be that anything is not possible. Haiti, like everywhere else, is thick with its past, and it will take more than “a very successful donors conference” (Hillary Clinton’s reassuring example on January 15) or the “development of clean energy” (one of Bill Clinton’s and George W. Bush’s prescriptions on January 17) to break its grip. Hope, like fear, is an easily exploitable emotion; and the disappointment of hope is not significantly different from despair. I am not sure what interests are served by talk of transformation, except the interests of cynics. The Red Cross has my money, but not because I expect to see a new Haiti. I do not. I also do not expect to see a lasting American commitment after the bodies are buried. I would like one, of course; but what I would like is not what counts. What counts is what we know about the inconstancy of men and the intractability of the world. That knowledge does not teach quietism, not at all; but we must learn to distinguish between meliorative action and millennial action. The struggle against suffering should take place soberly, grimly, with what the poet called a heart for any fate, because it sets out from the prior actuality of suffering. It is born disabused, or it is a misunderstanding. I recognize the risk in such an intuition. In demanding too little of the world, we may become complicit with it. Fatalism is always, almost as a matter of definition, self-fulfilling. And yet intelligence must not be blinded by its tears. Tragedy cannot be adequately met with the confidence and the cheerfulness of Leibniz and Bono. This time it will be different. Looking at Haiti, why would anyone not believe it, and why would anyone believe it? We cut our deliverances to the scale of our disasters, but it is never measure for measure: we cannot overtake what the world has done to us, what we have done to ourselves. It is just not the case that the less you believe in God, the more you believe in man. It may be impossible to believe in them both. The short-lived nature of ethical alertness is one of the most rudimentary facts of individual and collective life. So let us quicken to the intervals between our indifferences, because whether or not God exists, we do, and much of the time--though not now, as the planes clog the runways in Port-au-Prince--we are terrible.